Up to 18m tall and 8 spread. Moderate, reaches its full size in 20 to 50 years. Autumn foliage and winter stems. 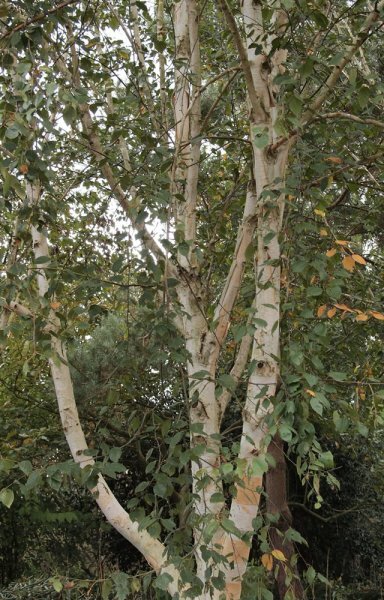 Birches are happy to grow in most soil types and pH. They will tolerate any aspect, exposed sites and occasional drought or waterlogging. Eventually growing to up to 18m tall (slightly smaller than Betula utilis), this is a medium sized tree with a bushy habit. It bears dark green, ovate and slightly serrated leaves from spring, which yellow in the autumn. Betula utilis var. jacquemontii tree is prized for its brilliantly white bark which creates a wonderfully ghostly display in winter gardens . The stems have horizontal lenticels which are dusky pink. Birches are monoecious, both the male and female flowers occuring in catkins. The catkins appear in the spring, the males are longer, brown coloured and hang downwards, whereas the female catkins are shorter, yellow-green and stand upright. 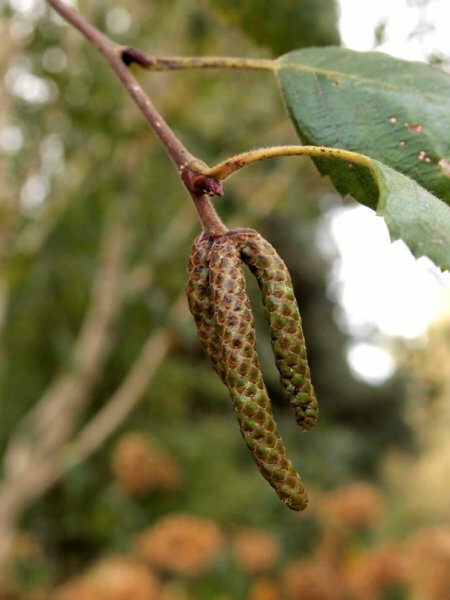 The resulting seeds are also contained in cone-like catkins which are initially green before maturing into brown. Great as a focal point in a large lawn, or planted in groups to make the most of the winter display of bark. It’s suitable for most styles or garden, though the bushy habit may be considered a little untidy for very formal designs. Try underplanting with snowdrops and spring bulbs for a fabulous winter/spring display under the attractive bare stems. 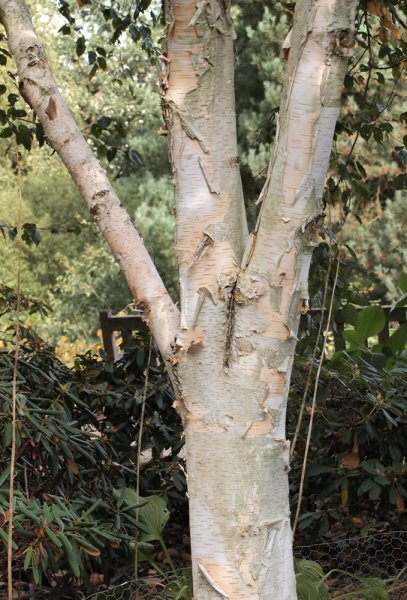 Birches don’t respond well to being transplanted, so if you are purchasing a bare-root tree then ensure it is young enough to adapt to the move. This is less of an issue with pot grown plants which should establish more easily, so long as you water them well after planting. Little maintenance is required. However, you may choose to wash the bark for a good winter display. This is best done just before winter with a cloth and warm water. A good rub should remove most of the algae which would otherwise dull the colour. Don’t be tempted to peel off any bark yourself, this can damage the tree. Any pruning should be done when the tree is fully dormant, from late summer until early winter. If you prune in late winter or early spring when the sap is ‘rising’ this can cause heavy bleeding of sap and weaken or even kill the tree. New trees can be trained as a feathered tree or as a central-leader standard. If you want to have a long, clean trunk (or trunks) to display the bark in winter, you should regularly prune off any side shoots when they are very small, to keep the scars from their removal as discrete as possible. Other than this, pruning should be kept to a minimum as birches are vulnerable to fungal diseases. 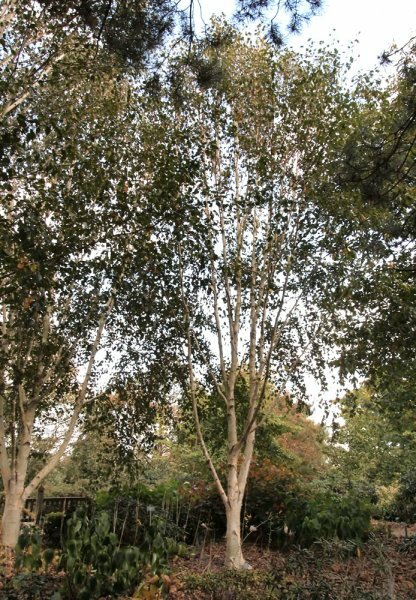 As birches are fairly short lived trees, it’s often better to replace a tree than try to prune it to a particular shape or size. Seeds should be collected from the catkins in midsummer. Separate the seeds from the chaf by breaking the catkin apart and gently blowing over the bits, the chaf will be blown away leaving the seeds. They can either be sown straight away in raised seedbeds (avoid sowing on a windy day as they’ll blow away!) or dried then stored in a refrigerator for around 6 weeks to break their dormancy, then sown in containers at 10-15°C. Birches self-seed readily, if you find a seedling them wait until it has two to four leaves and before transplanting it. Softwood cuttings can be taken from mid spring to early summer. Once the cuttings have rooted they should be fed regularly. Birches can be short lived trees and older specimens are susceptible to fungal attacks, primarily by birch polypore (Piptoporus betulinus). 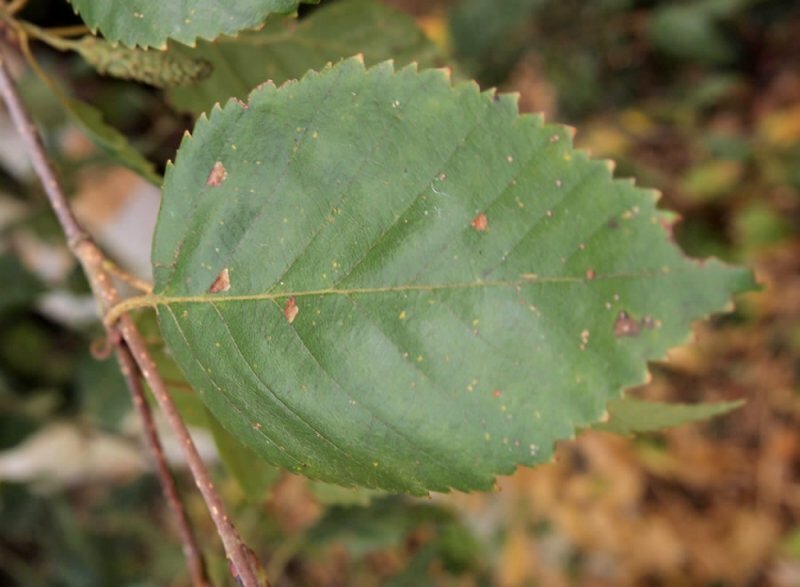 Diseases including birch rust, powdery mildew, and viruses occur on birches. Pests including the birch leaf mining sawfly, birch aphids, moth caterpillars and leaf weevils can be a problem. Witches’ brooms can also occur, which are sometimes caused by the fungus Taphrina turgida on birches. The common name ‘birch’ is thought to derive from an ancient word for ‘to shine’, presumably relating to the white bark. 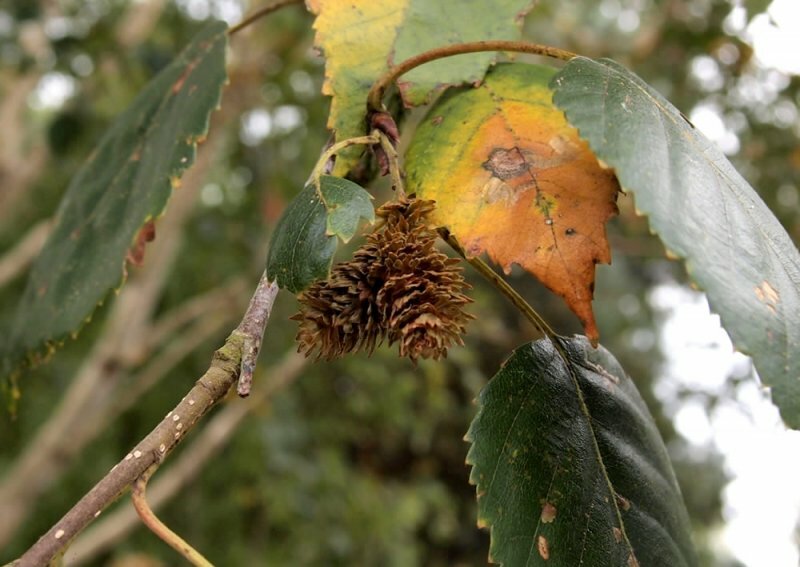 Betula utilis was first identified from samples brought back to the West from Nepal in 1820. The species name ‘utilis’ refers to the utility (usefulness) of the wood. The ‘jacquemontii’ variety was first identified in 1841. The birch tree has been a great resource for centuries, particularly so because of its quick growth rate. Birch wood is used to make a wide range of products including furniture, charcoal, paper and for fish smoking. 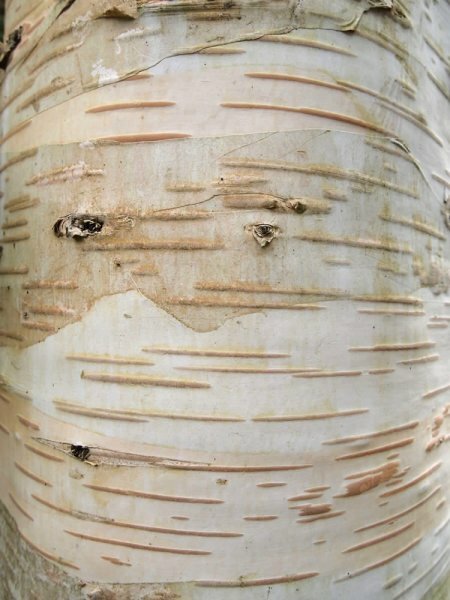 Early sanskrit writers refer to the use of birch bark as paper for books as far back as the third century, the bark is also used in the tanning industry to fragrance leather. The flexible twigs are traditional used for making brooms and ‘the birch’ – a type of whip which was once used for punishments in schools and prisons.